--All wearPro sunglasses are made from first class materials. --Fashionable style and first class quality is what we convey to our customers. --Of course, the frame and nose supporter is made from skin-friendly materials. 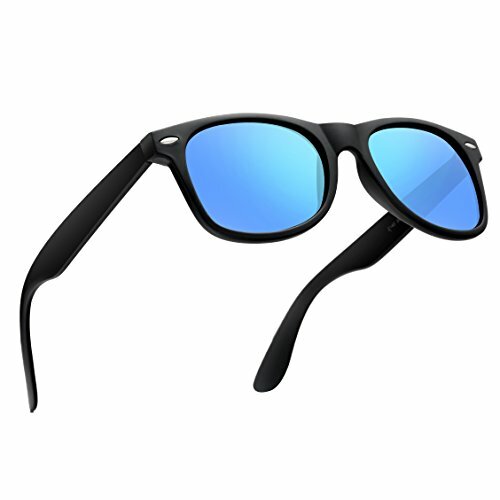 --Synthetic resin frame and arms constitute a sunglasses with super light feature, just 20g that you can hardly feel them on your face and that feature enables you a long-time wearing without fatigue. --Filter out 99% of reflected glare without haze or optical distortion. --Protect your eyes and enjoy a high clarity vision more comfortably. --We also provide a polarizing cardboard for you to test the polarized lens of our wayfarer sunglasses. -- This 2018 brand new Italian designed retro polarized wayfarer sunglasses for men. --Combine retro outlook with modern high-tech materials. --Low-key appearance but show your high-end taste, add another point to your charm. --Whether you're into driving, fishing, baseball, golf, or you're a Kurt Cobain nostalgic, a fancy motorcycle rider or a club and party follower. All could use the benefits of the polarizing effect and the attractive appearance of this retro vintage wayfarer polarized sunglasses for men.